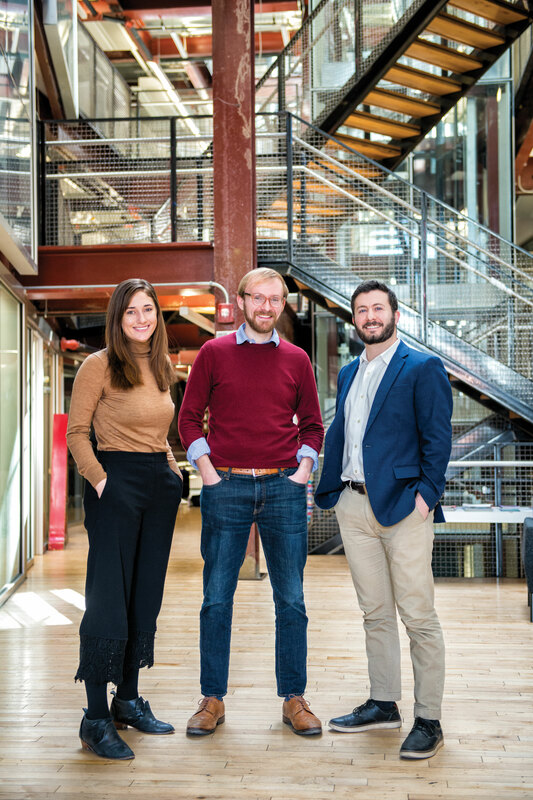 Caitlin Youngster ’14 (CY), Sam Emory ’15 (SE) and Brian Nunziato ’14 (BN) talk about founding and running Drexel’s Alumni Architecture Association, what the group means to architecture graduates, and what it means to them. In 2016, three young alumni started reminiscing about their Drexel days. That led to them forming the University’s first official professional affinity group — the Drexel University Architecture Alumni Association (DUAA). Now, Youngster, Emory and Nunziato are working hard to keep the thousands of architecture alumni who have graduated from the program together to network, learn and grow as professionals. Why did you start the Drexel University Architecture Alumni Association? BN: We were hanging out discussing our time at Drexel. That conversation drove our initial outreach to the University, to see how we could get involved and make the program better. We also wanted to stay connected with all the people we built relationships with in school. CY: There were already smaller networks of architecture alumni, but we couldn’t believe there wasn’t a framework for all these individual groups to come together. We looked at other universities with prestigious architecture programs, and they have robust alumni associations. We thought having something similar at Drexel would give more gravitas to the program. What makes this affinity group a valuable resource for architecture graduates? SE: There’s a unique quality to the connections that arise out of the architecture program. We’re all very tight-knit. Maintaining that social and professional network was definitely on our minds when forming the group. CY: Every industry says they’re based on relationships, but it’s especially true in architecture. You form networks of people you work well with, and you foster those relationships because it makes for more successful projects. What was the process for formally establishing the group? CY: We first thought about formalizing the group ourselves. But we decided we needed administrative help so that as the leadership changed over time and people graduated, there was a central contact that would hold all the information and alumni contacts. We hadn’t jumped that logistic hurdle yet, but Drexel’s alumni relations office made it very easy. BN: Lauren Villanueva was the first person we contacted. It was very helpful to work with the alumni office because when we had questions, Lauren was there to help, to provide us with information or ideas. What kinds of events does the group organize? SE: First, we had a traditional happy hour, but it didn’t attract the full range of architecture alumni. So now, by layering networking events onto professional development events and educational opportunities, we attract a broader alumni base. BN: We developed the Architecture FIRM-entation series to connect more closely with architectural firms. The events take place at a firm with a Drexel connection, whether a Drexel graduate runs the firm, or a large group of alumni work there. The alumni present on the work that they do and their experiences coming out of school and working in the field. The tour we organized at the Raymond Farm Center for the Living Arts [in New Hope, Pennsylvania] was an event that let people experience a historic place that’s also relevant to the architecture field. We provided time after the tour for alumni to ask questions of the presenters and mingle with fellow alumni. It also highlighted a professor and a graduate of the architecture program [Jennifer Shin ’13] who were integral to starting the center. CY: For the Nakashima Woodworkers tour, we were able to leverage our networks and go on a private tour to see buildings that aren’t typically open to the public. The event was partially subsidized by Drexel because we’re a formally organized alumni group, so we were able to make it more affordable for everyone. What do you get out of your involvement with the group? BN: It’s satisfying to be involved in making the program we experienced better because we would’ve wanted somebody to do that for us. CY: The architecture field is founded on mentorship and collaboration, so this association is providing more of that for the alumni community. The part we’re playing in that is personally rewarding. SE: People come back to Drexel and feel like their degree is alive and valuable and continuing to thrive. That’s an important experience to offer alumni, and it’s very satisfying to be a part of it. What is a professional affinity group? Professional affinity groups connect Drexel graduates in similar industries or professions and provide them with opportunities to meet one another, network and stay up-to-date on the trends in a particular field. Current groups include Real Estate Alumni Network, Drexel Marketing Alumni Group, Alumni in Hospitality, Drexel University Architecture Alumni Association, and Alumni in Academia. Groups in process of forming include: Public Sector, Entrepreneurship, Health Sciences, Interior and Design. For more information about Drexel’s professional affinity groups, visit drexel.edu/alumni or contact the Office of Alumni Relations at alumni@drexel.edu.